So I went to see to the Saturday matinee performance of Press Gang at Lasalle College of the Arts yesterday. Lim Kay Siu (Frankie Foo) was sitting in a row in front of me. It wasn't cheap — $144.50 to book two tickets for my wife and me from Sistic and that's after a 10 per cent discount with my POSB debit card. But I wanted to support the playwright, Tan Tarn How, whom I consider a friend, though we haven't seen each other for maybe 20 years. 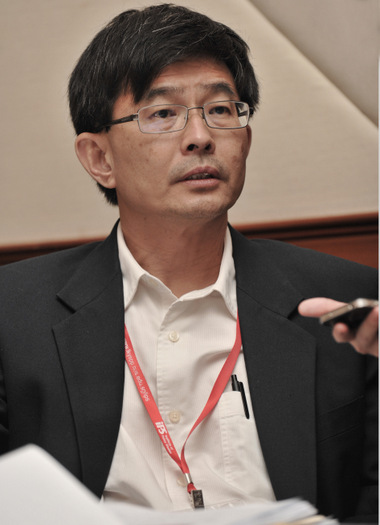 I knew him at Mediacorp in the 90s when he was the head writer of Growing Up and, of course, VR Man. 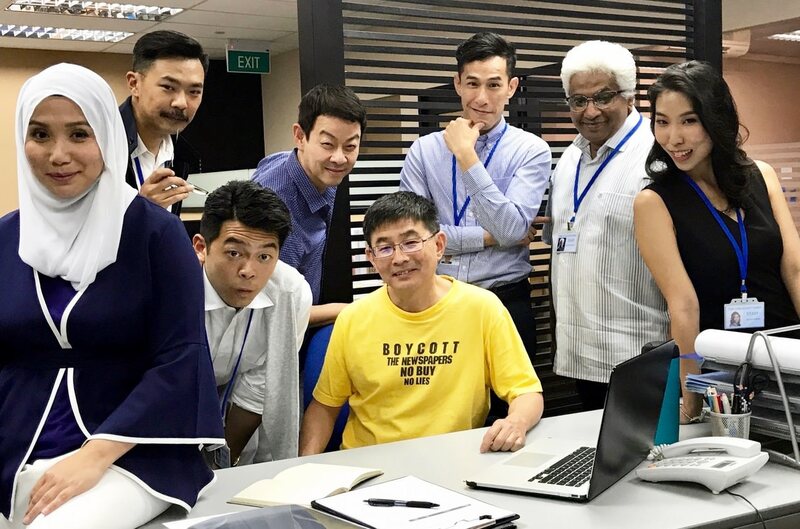 I had never seen any of his plays before, but I wanted to see the Ivan Heng-directed Press Gang because it's about working in a Singapore newspaper, something I have been doing for the past 10 years. The play is set mostly in the newsroom of Singapore Times, a sort of fictionalised version of The Straits Times where Tarn How used to work. At the start of the play, I grinned in recognition when I heard the word "offstone" and the line about subs screwing up headlines and captions, although actor Shane Mardjuki said "offstone" with an odd emphasis like the word was alien to him. Actually, I found that the whole cast spoke with a mishmash of distracting accents like in a Channel 5 drama. I don't know. Maybe local English plays are supposed to be like this, but the often stilted dialogue didn't help. 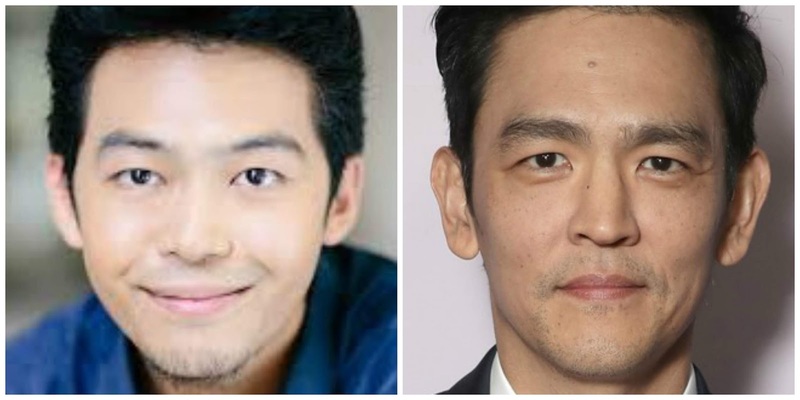 I was also distracted by how much actor Benjamin Chow resembled US actor John Cho (Sulu in the new Star Trek movies) without sounding anything like John Cho. But that could just be me. The thing that really took me out of the play was the central dilemma that drove the plot: Should the paper report the rumour that the prime minister's son slapped the deputy PM? The problem is, there's no dilemma at all. Newspapers, in Singapore or anywhere else, aren't supposed to report rumours, regardless of who the rumours are about. And it's not because we're afraid of the big bad Government. It's because we know rumours may not be true. That’s why they’re called rumours. And despite lapses, journalists generally still care about stuff like that. Don’t wanna be accused of fake news. Or sued for libel. If the paper wanted to pursue the story, it would just try to get someone to confirm on record that the incident happened and report that. Otherwise, no story. But is the slapping story even worth pursuing in the first place? This was where the play felt a little outdated despite references to Facebook and Hardware Zone. We're living in a time where our real-life Prime Minister's sister has outright accused the PM of abuse of power on Facebook for all to see. The play’s slapping rumour seems rather quaint in comparison. I should explain here that in the alternate universe of the play, even though Facebook and Hardware Zone exist, Lee Hsien Loong doesn't. The PM in Press Gang is an unseen fictional character who may or may not have a resentful fictional sister. "You may also have heard this old story about Loong. In case you have not, I'll tell you now. Back in 1990, Loong had a quarrel with Richard Hu. S. Dhanabalan sided with Richard. Loong lost his temper. He reached across the table and gave Dhanabalan a tight slap. The whole Cabinet was thrown into commotion. I then forced Loong to apologise. I must be suffering from amnesia. I just cannot remember this incident. Now you know how creative Singaporeans are." It can get a bit confusing trying to distinguish what in the play is real, based on something real or totally made-up. But that's part of the fun. For instance, the columnist played by Amanda Tee is obviously based on Sumiko Tan in a surprisingly self-aware portrayal. My wife believes that the Malay character played by Oniatta Effendi is based on Zuraidah Ibrahim, an ex-Straits Times editor who moved to Hong Kong with her husband, Cherian George, who also got (half) name-checked in the play. The veteran reporter played by T. Sasitharan, who got the best lines, reminded me of former New Paper (now back at Straits Times) editor Dominic Nathan physically if not character-wise. I have never worked at The Straits Times, so I can't comment on how accurate the office politics or politics politics depicted in the play are. From my perspective at The New Paper, which is at best Straits Times-adjacent literally, figuratively and organisationally, parts of Press Gang rang true, but much of it sounded like Tarn How straining too hard to make a point, however valid that point may be. But the whole "Should we print a rumour?" thing just didn't work for me. In an early scene, there was mention of the paper previously reporting someone having an affair (safe to say, based on real life). I might have enjoyed the play more if it were about that instead. Press Gang ends its run tonight.